Since our footballing travels take us to a range or weird and wonderful places following the Whitecaps at all the various levels and the local soccer scene, we thought we’d start a “Groundhopping” feature to take a look at some of the more characteristic football stadia that we end up watching from in the US and Canada. We’re going to kick the feature off by having a look at the stadium which hosted the Whitecaps PDL game against Seattle Sounders on Wednesday night – Cheney Stadium in Tacoma, Washington. Cheney Stadium, home of the Tacoma Rainiers minor league baseball team, has gone through something of a refurbishment in recent years. Around $28 million has been spent making the 52 year old stadium look brand spanking new, and impressively they managed to do it all between the last pitch of the 2010 MILB season and the first pitch of the 2011 one – 210 days. 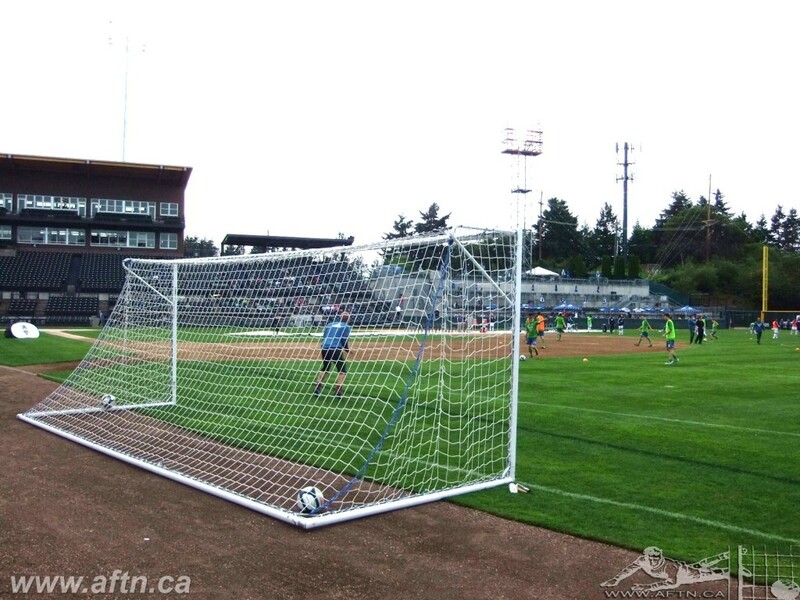 On Wednesday May 31st 2012, it also hosted a historic game between Seattle Sounders U23’s and Vancouver Whitecaps U23’s in PDL action, in what was the first football match to be played at the stadium in over 35 years. The moment didn’t exactly capture the local Tacoma public’s imagination, but there were a few hundred people who turned up to see a thrilling 3-3 draw. 712 to be exact. A far cry from the current 9,600 capacity. The night was likely to have attracted a bigger attendance if the Sounders didn’t have an US Open Cup gaming at Starfire clashing and kicking off an hour later. It could all have been avoided if the Sounders hadn’t moved the date of the game to give them an extra day after the weekend’s MLS action and then bought the rights from Atlanta to play the game at home. 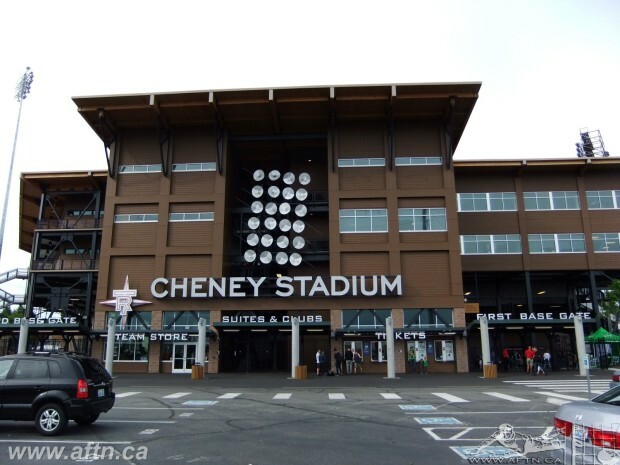 Cheney Stadium is named after local businessman Ben Cheney, who was the man behind bringing AAA minor league baseball to the city in 1960. Attracting a team was pivotal on getting a new stadium built and Cheney’s hard work paid off and the stadium opened on April 16th 1960, with the Tacoma Giants as the tenants and 6612 fans packing in to see the opening game against the Portland Beavers. The stadium was built in only 106 days, at a cost of $940,000. The speed of the construction saw the stadium dubbed “the 100 day wonder”. Looking around the stadium now, you would never think that it is anywhere near that old, as the 2011 renovations have made it all look to be new, with new green seats pretty much throughout, new roofing, 16 luxury suites, a doubling of concessions, a new restaurant, a kids play area and general repairs and touching up. All materials for the renovations were local, either from Tacoma itself or elsewhere in the Pacific Northwest. Pretty sure we can’t say the same about BC Place. 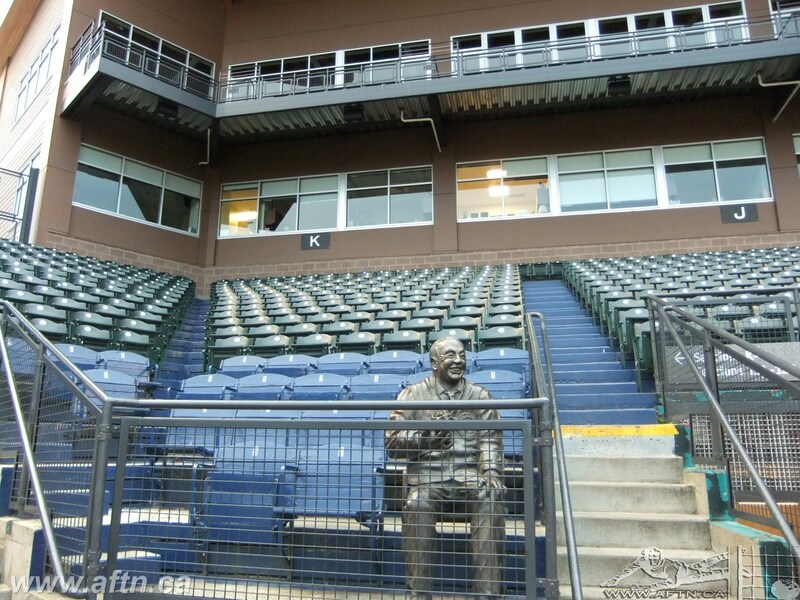 Some of the old blue wooden seats remain in Section K of the grandstand though and one of them is occupied by a statue of Ben Cheney in the front row. He was made an honourary Southsider. These seats aren’t the original ones from 1960, but from an earlier renovation. The original seats for the stadium had come from Seals Stadium in San Francisco and it was the SF Giants who moved their farm team from Phoenix to Tacoma for that inaugural season. 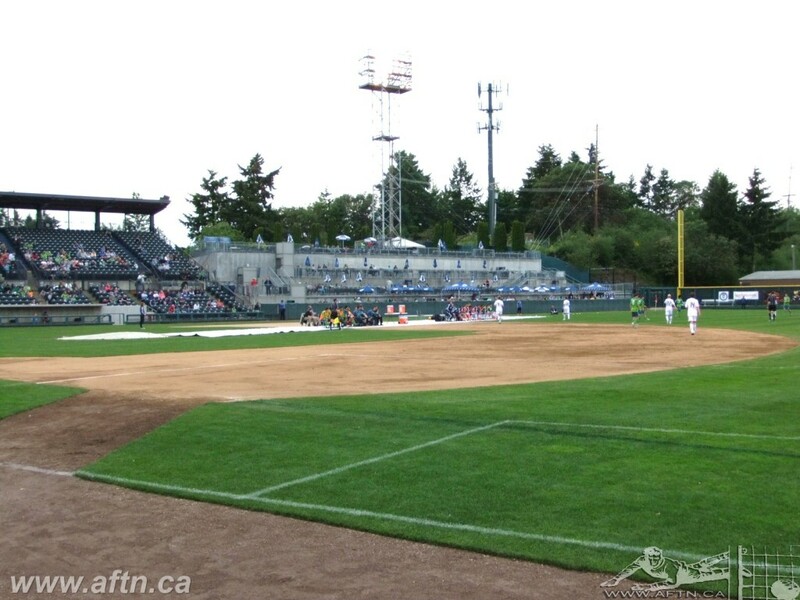 Whilst the stadium has played host to seven incarnations of Tacoma’s minor league baseball teams, it also has a previous footballing history. In 1976, American Soccer League side Tacoma Tides played 12 matches at Cheney Stadium. Despite making the playoffs, the team folded after only one season and it wasn’t until 2012 that football returned to the stadium. It was perhaps fitting that it was the Seattle Sounders U23 team that were one of the two teams who played in the historic occasion. In January of this year, the Sounders bought the PDL franchise of the Tacoma Tide, who came into existence in 2006 and adopted the Tide name a year later. The team has now been re-branded as the Sounders U23 team. So even approaching 36 years later, it was still a Tacoma Tide(s) team that was playing football at Cheney Stadium. And it was a neat honour for the Whitecaps to be the opposition and from my point of view, to be present at the match. There will be a second PDL match played at the stadium this month, when Kitsap Pumas will be the opposition. So what is Cheney Stadium actually like as a football venue. Well to be totally honest, it’s a bit mixed. Not surprising really as baseball stadiums and football don’t really make happy bedfellows. That’s why there’s not a lot of such joint use facilities. I know the old Piggy Park was basically a baseball venue, but you also saw from that how non ideal it is. What a difference they’ve made to that place with the renovations. The problem basically comes down to the shape of the respective fields and there is no way that any seating configurations can accommodate both sports to the same advantage, and so it proved at Cheney Park. I took up position behind one of the goals, the only one you could actually stand behind. For sake of describing how the stadium was set up, let’s just call this the south side! You’re behind a fence, which has a padded cushion in front of it to stop the baseballs. The padding is in front of a chainlink fence and you are able to hang flags over it, as long as you have long enough string tied to them or tape. We did, so the AFTN “Whitecaps/East Fife” flag was on full display. You are really close to the action and the goal, even more so than at Swangard and behind where we were standing is a grassy hill and “family zone”. The other end (the north end) just has a giant fence and hosts a camera gantry, electronic scoreboard and giant video screen. The east side is also not in use for football spectators, being just a giant wall. There was enough room between the touchline and the wall for photographers to be positioned. The bulk of the seating is in the west and the south-west of the stadium. Those in the south-west seating closest to the goal had the best view from the seats and that was where the bulk of the fans chose to sit and they were all crammed in together. You’re actually behind one of the baseball dugouts and the more you get into the south-west position, the more you are in the corner and looking out diagonally on to the pitch, and the further away it feels. That is nothing though compared to how far away you must feel if you were in the west stand, which also hosts a VIP seating area with restaurant. The distance between the people there and the touchline is around half the width of the pitch and you also have the two football team benches in your sightline too. It’s just weird viewing angles all round really. I took a wander up the press box at half time (on west side facing out onto one of the 18 yard lines) and the view is just so high up and feels so detached from the action. The giant screen in the north end was excellent. They had two, maybe three or four, cameras filming the game and playing live on the screen. No replays though! The Caps players were filmed in the line up during the anthems and you could see their amusement as they appeared in full close up on the screen! Probably a first for most of them. Interesting to note as well that they didn’t have a Canadian flag flying for the game, only an American one! Not the lush green parts of it, the ball seemed to roll perfectly on that. That was a great grass pitch. When you have a baseball field you always wonder how they are going to cover up the sand of the diamond for a football match. Turns out if you’re in Tacoma, you just don’t bother. They just left it. It must have felt like beach soccer for the guys that had to play on that part of the pitch. The bumps as the ball went from grass to sand were incredible and could have had an impact on the game, but thankfully didn’t on this occasion. The newly increased concessions seemed vast. Only one was open for the game, and the line ups were huge before the game kicked off. Standard fare, but some more unique food options seemed to exist in the ones which weren’t open. Would be good to see what was on offer for a baseball game with a bigger attendance. Entry was $10 for general admission seating and $20 for the VIP area which included food and a bar. A 12 page photocopies program was produced, with adverts and squad line ups. Overall, it was great to see a game in a new stadium for me, but if I hadn’t taken up the vantage spot I had, it would have been a pretty strange all round experience. Baseball stadiums and football don’t mix. It was a nice touch to have it there after all these years, but unless they can sort out the pitch to have the sand covered, it’s really better if they wait another 36 years for the next games. We’ll have another “Groundhopping” feature soon, but if this is the kind of thing that interests you, then check out the Groundhopping Canada blog.